1 pair of geta with black velvet straps : wood, velvet ; each 9.25 x 4.25 x 2.125 in. 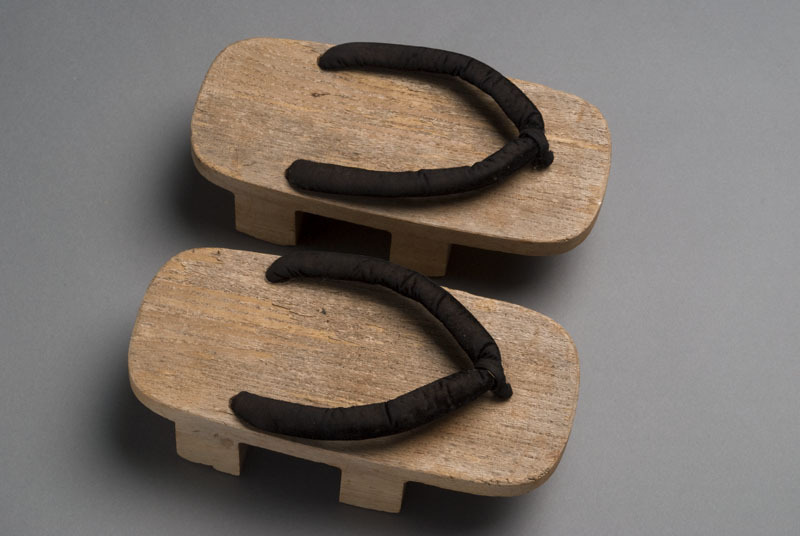 Japanese style wooden slippers composed of a baseboard (dai) resting on two supporting pieces (ha or teeth) with a black velvet strap that is secured at the front middle of the baseboard by a decorative metal piece (flower shaped) on underside covering hole for toe strap, and at the sides of the foot. The geta are identical in shape: right (A) and left (B) side. Edges are rounded. Written in black ink felt pen on bottom: B. Kawakami.